The flat top M4 Mil-Spec upper receiver are forged CNC Machined from 7075-T6 Aluminum, the hardest and most durable material of any upper! To ensure even more strength they are hard coat anodized. The 16” spiral fluted .223/5.56 Wylde barrel is the perfect marriage of design and precision! The Wylde stainless steel barrel fires 5.56 or .223 ammo in less than 1” groupings at 100 yards! This heavy barrel is made from the highest quality 416 R Match Grade Stainless Steel for shine and durability! 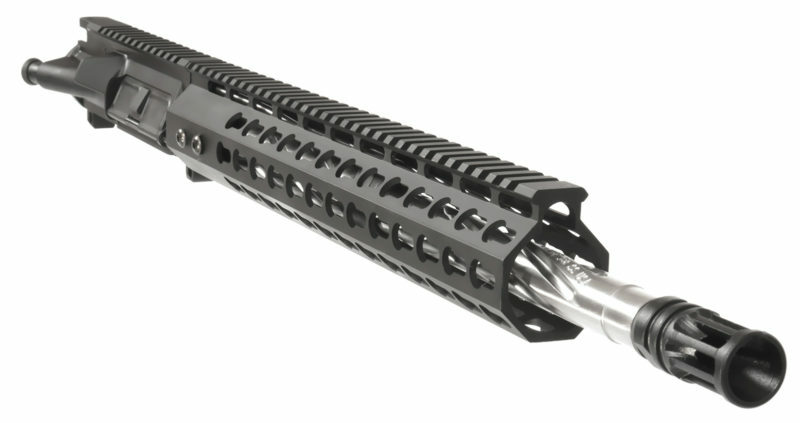 This barrel has a 1:8 twist rate, carbine gas system and head spaced twice from the US manufacturer. The rail is engineered and manufactured in Germany. The 12” Keymod has a modern design and is made from Airplane grade Aluminum, extruded with the most accurate machines in Germany and CNC milled with computer accuracy! The rails are then hard coat anodized to eliminate corrosion.To top it off, Hera’s “Anti-Turning Milling” eliminates turning of the rail! We assemble there uppers exclusively with Veterans of our Armed Services! These military men have an eye for detail, they scope port holes, torque to military specs & quality check each upper.The result, the highest quality upper assemblies for the money.